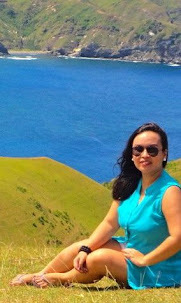 The Happy Island of Catanduanes is not just about sand, sea, and sun. It is also known for having many historic churches and pilgrimage sites, most of which were built in the Spanish colonial times. In between our journey to the pristine beaches and beautiful countryside of Catanduanes, we were fortunate to have visited four churches. 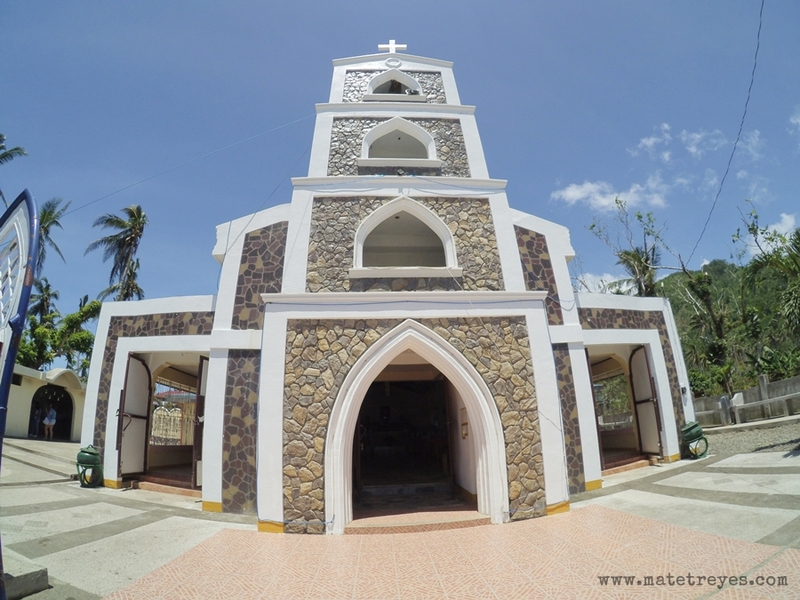 One of the churches in Catanduanes that was built during the Spanish era, St. John the Baptist Church or Bato Church was built from coral limestone and designed to withstand damages from typhoons and monsoons. 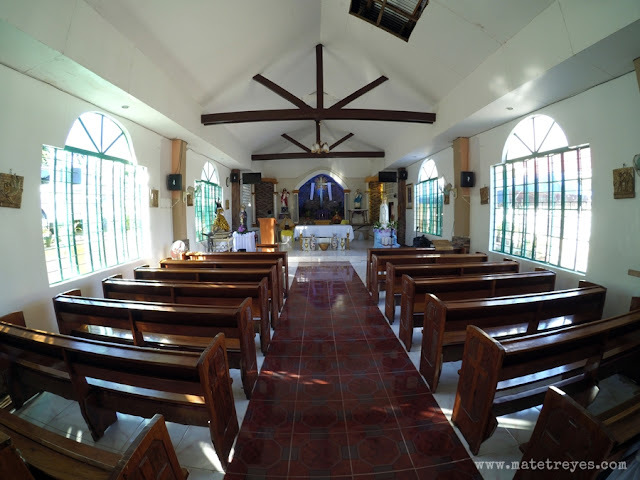 The church, which features a very simple, classical structure, is located about eight kilometers east of Virac, right parallel to Bato River. 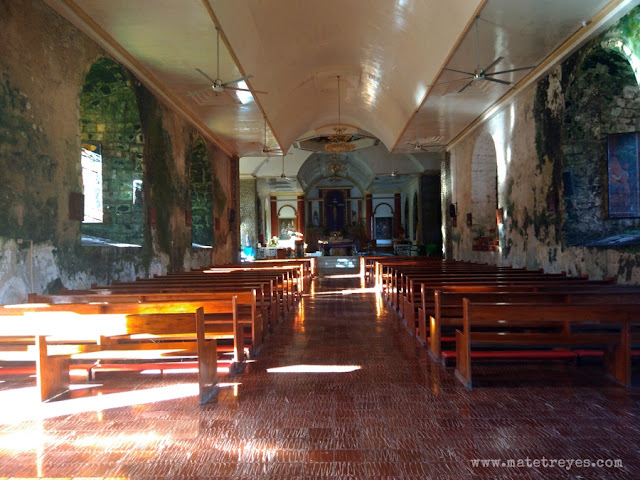 It is the oldest church in the province of Catanduanes. Believed to be a miraculous site, Batalay Shrine draws many pilgrims especially during the Holy Week. 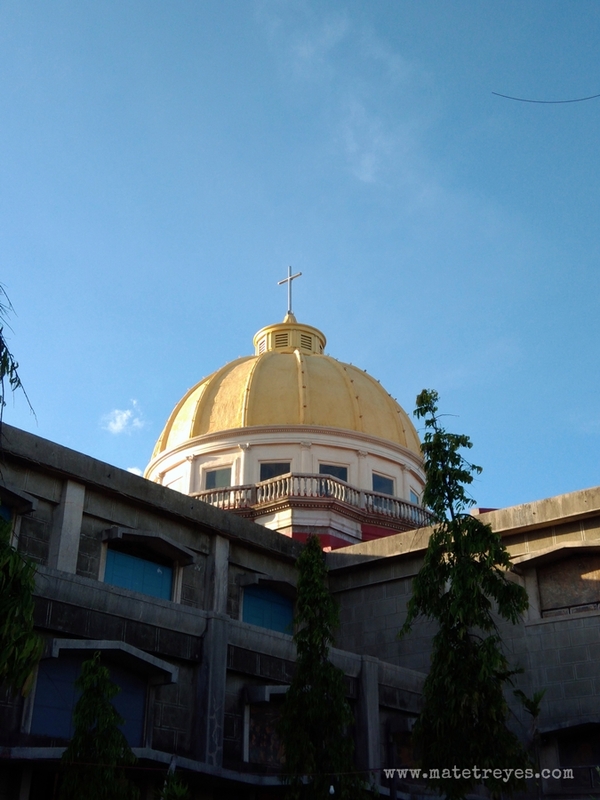 It is said that the site is where the first cross was planted in the province to mark the burial place of the Augustinian priest Fray Diego de Herrera who was killed in Brgy. Batalay, Bato, Catanduanes in 1576. 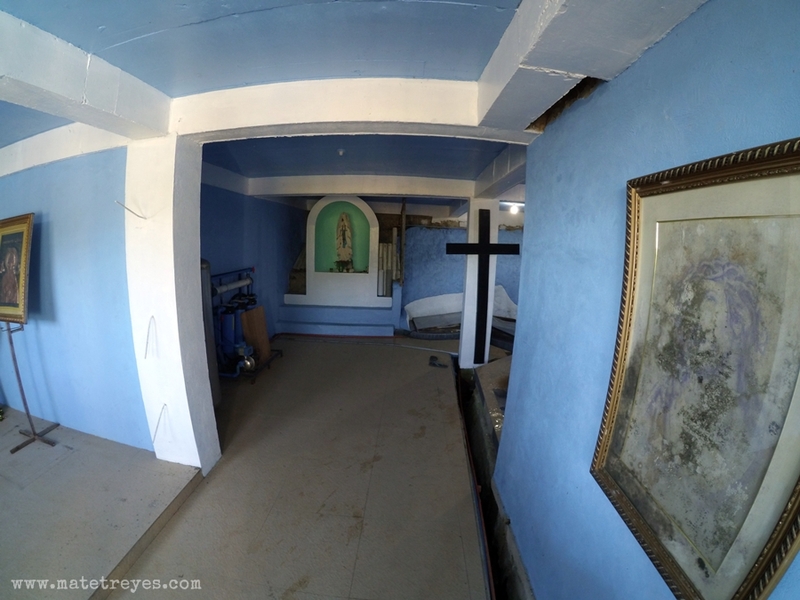 According to folklore, it took many attempts before they could plant the cross on the right spot where the priest's body lies, because no cross would stand. They said each cross planted were uprooted every sunrise. Finally, one morning, they saw that the cross they planted did not fall, and so to their curiosity, the natives dug beneath it and found the remains of Fray Diego de Herrera. A spring had also sprung near the cross, which, to this date, is believed to have healing powers. When we went there, we had to go down to the basement where there are faucets where you can fill your bottles with water. It is not the water that will heal you; it is your faith. It was harvest season (October to November); the people were busy harvesting the palay. One late morning, another happening was in the making. Pacio Socao, together with his companion, was herding carabaos in the Culapnit, a few kilometers away from the Poblacion. After placing their carabaos in a grassy plain, Pacio started to look for a place where he might rest, and he chose an "Iba" tree commonly called kamias. When he started to climb, he was attracted by a luminous object sparkling light under 10:00 o’clock in the morning sun. He picked the object and saw a picture of a face of an enchanting woman printed in a hard stone. He showed it to his companion and remarked that it might be an “aswang” or some evil spirit, so Pacio threw the stone and it landed near in carabao mud-hole (lab-ogan) surrounded by thick bushes and guava trees. For a moment, the incident was forgotten by two boys. One afternoon before they went home, Pacio went near the same Iba tree and there he saw again stone with a picture and put it in his pocket. They then started to go home. When he reached home, he kept the picture up between the nipa shingles roof of their house. Early in the evening, his mother was surprised to saw the shimmering light coming from the roof . She called Pacio and requested him to see what the light was. Pacio obeyed and found out that it was the stone he inserted. His mother, Maria commonly known as Bengge, kept the image inside their trunk, a box like wooden container for clothes and valuables. At this point, Bengge remembered, she with other people in the field harvesting rice, heard loud ringing of church bells from nowhere and this she believed was when Pacio found the image. A few later, they started to smell a rare sweet odor, the fragrance of it does not resemble nor equal to the sweetest scent of blooming flowers in the morning. They later discovered that sweet odor was emanating from the trunk where the image was kept. 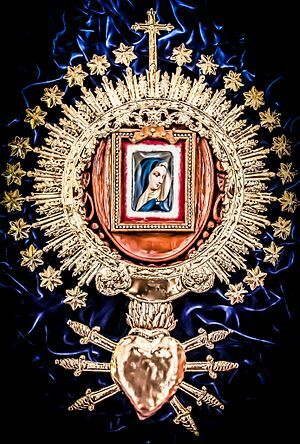 They put out the image and enthroned her on their altar. The picture started to radiate more beautifully, with her forehead prominently and partly covered by a blue white veil. A mole is sometimes seen on the forehead and many have seen the image wink. The lady has long eyelashes which made her even prettier. Natives of the place were ready to accept the apparition yet reluctant to openly manifest it, had it not been for the first wave of the pilgrims coming from the different coastal towns of Camarines and Albay. These people rode in sailing boats called parao. With them were sick people who were carried in hammocks. Asked why they came, they all answered, they were sick and they can only be healed by Maria. A middle aged woman, nicknamed “Bengge”, came to their houses to ask for alms and many forms of material aid, so she could start building an ermita in honor of “Our Lady of Sorrows” (Nuestra Señora de Dolor). The replay of the pilgrims surprised the natives for never had Bengge travelled far to reach the mainland, except the places within the confines of Calolbon. 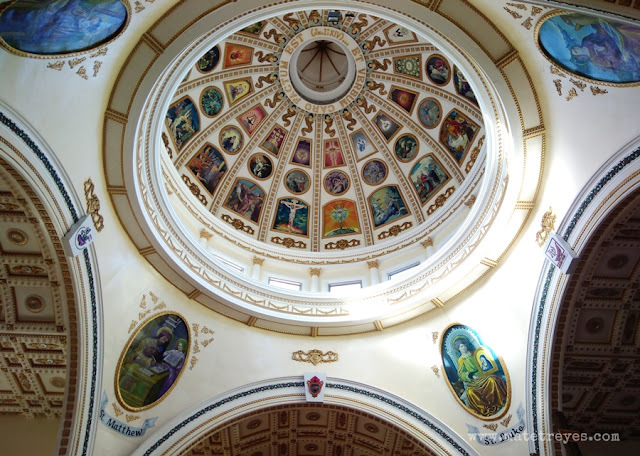 Nestled amidst the bustling Virac town proper, the Immaculate Conception Cathedral fairly resembles St. Peter's Basilica in Vatican. From the outside, you could already see the imposing dome, which, as you enter, reveals a spectacular mural that is one of the most stunning domes I've seen so far. 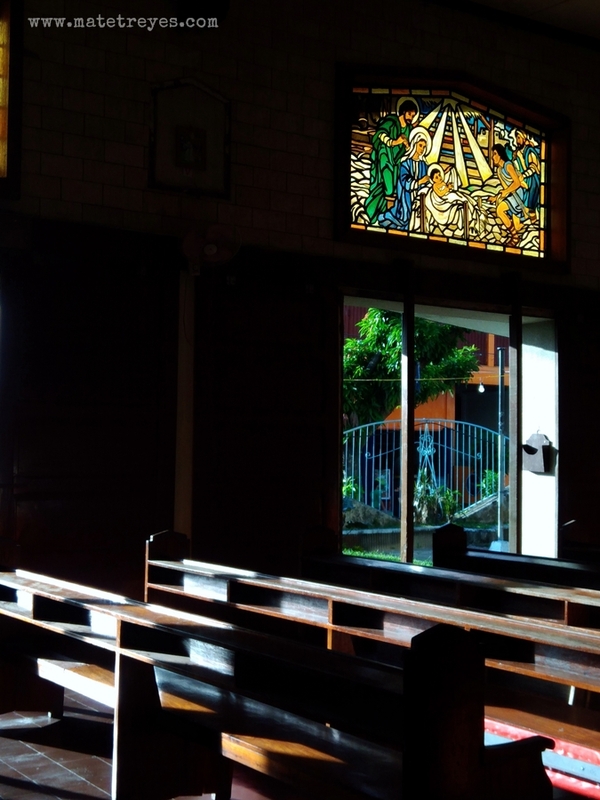 Also inside are charming stained glass windows that strike a contrast to the rich hues of wood and concrete. 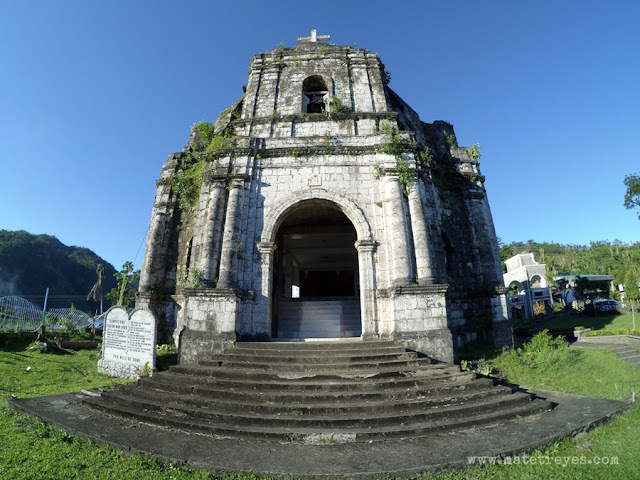 So if you are in Catanduanes or in the Bicol region for Holy Week, you might want to include these churches in your Visita Iglesia list. 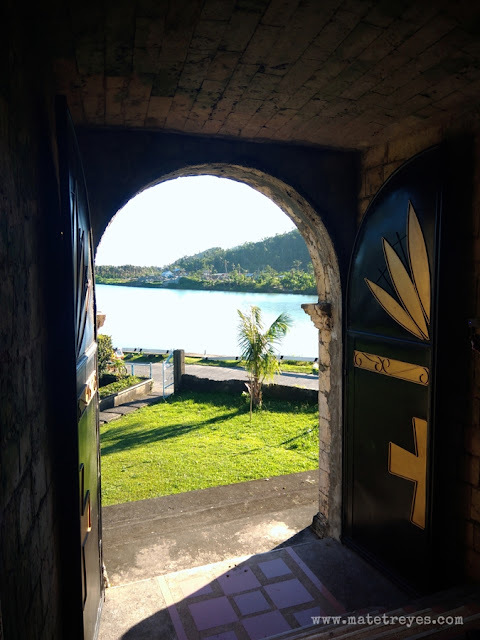 Or, if you are on the Happy Island anytime of the year and you practice the same faith, it will be nice to add these to your itinerary.